Home > Blog > What kind of artist are you? Hey there, all you little Artists! I’m sure you already know that there are a million different ways to find your creative outlet—whether you’re working with basic contour line, watercolor, charcoal, aluminum dust…Wait a minute. Aluminum dust? That can’t be right. Well, actually, by the early 1960’s this had become a very popular medium with which to work. What is aluminum dust, you ask? It’s the stuff inside an Etch-A-Sketch, of course! 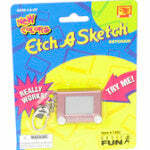 I know you’re all WELL aware of the Etch-A-Sketch—one of the most popular toys of all time! In the 50’s, the Lincrusta Co. hired an electrician by the name of André Cassagnes. Lincrusta Co. was a manufacturer of wall coverings. They used aluminum powder in their processes. Installing a light-switch plate at work one day André peeled away a decal and made a couple pencil marks on its face. He was intrigued, however, when he found that the pencil marks had transferred to the other side. The other side was covered in aluminum powder. He called it ‘L’Ecran Magique’ which translates to ‘The Magic Screen’ in English. Showing off his invention at trade shows, André’s Magic Screen eventually generated some interest from an American manufacturing company called Ohio Art. 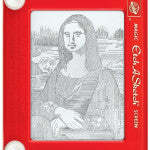 Although it was heavily marketed to kids, the Etch-A-Sketch became quite the toy for artists of all ages like Jeff Gagliardi who started using the toy during his adulthood in the 70’s. He mastered it and used it to create amazingly intricate sketches. 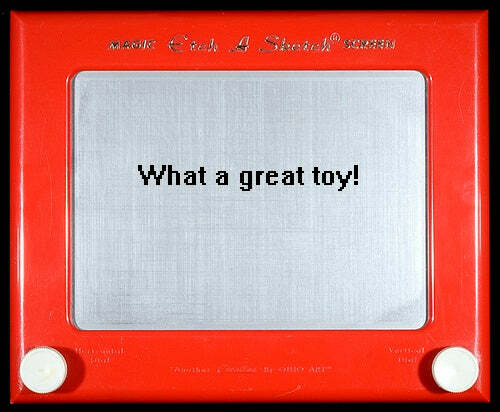 Playing itself in the Toy Story movies, the Etch-A-Sketch has certainly proven itself over the years without losing steam. 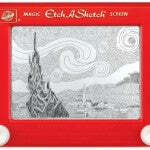 As popular as ever, it seems the Etch-A-Sketch has etched a place in our hearts. Pick up your own right here at Everything Summer Camp.